So let’s talk about Amber. 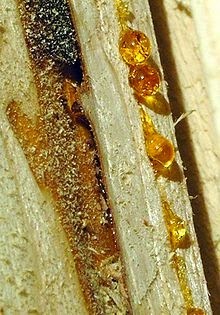 What is Amber? Where does it come from? How is it formed? Let’s find out! 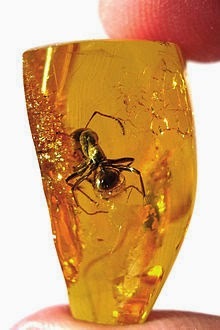 Amber is a fossil and it comes from ancient trees, believe it or not. You’d be surprised at how many people think that Amber is a stone. It looks and feels like one, but it is not at all. It is fossilized tree resin, often mistaken for sap. But resin and sap are two totally different things. Resin is a waste secretion that plants give off as a means of protection. There are compounds in resin that repel herbivore animals and insects that might eat or harm the plant. There are also compounds in resin that attract predatory animals and insects that eat the ones that eat plants. Pretty crazy! Resin is a thick and distinctly different liquid that emanates from the plant and is unlike other fluids within the plant. Resin is used for making glazing agents, adhesives and varnishes. It is also used in perfumes and incense. Frankincense and Myrrh are good examples of what kinds of things are comprised of resin. Sap, however is quite different. Sap is a fluid that the plant develops completely separate from resin. Sap is used as a transport of water and nutrients the plant needs, and disperses these essential nutrients throughout the plant. Let’s get back to Amber. So we've established that Amber is made of resin and resin is a plant secretion. Now, a lot of times bugs get caught in the thick, flowing resin of a plant when they land on it. They become engulfed in the resin, then over time that resin hardens and over lots and lots of time, that same resin becomes a fossil. A piece of Amber with an ancient bug inside can be worth lots of money! Amber has been valued and admired for its beautiful deep honey coloring since Neolithic times. Since ancient times it has been valued as a gemstone and used as jewelry, medicine and an ingredient in perfumes. 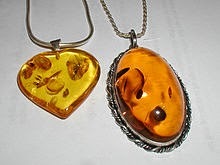 There are different types of Amber. One type is resinite, which is found in coal seams. If it is found in a coal seam in New Zealand, it is call ambrite. If Amber is heated over 392 degrees, it begins to decompose and an oil is yielded from it. This oil can be mixed with other oils to make amber lac or varnish. 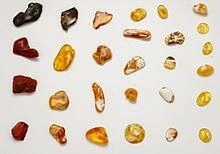 Only certain types of resin can survive long enough to become amber. For this to happen, the resin must either be shielded or resistant to things like fungi, bacteria, extreme heat or weather, and other such forces. All in all, Amber is pretty amazing. From what it’s made of, to how it forms, to what it has been used for and what it is used for today. No wonder it is so valued and precious.